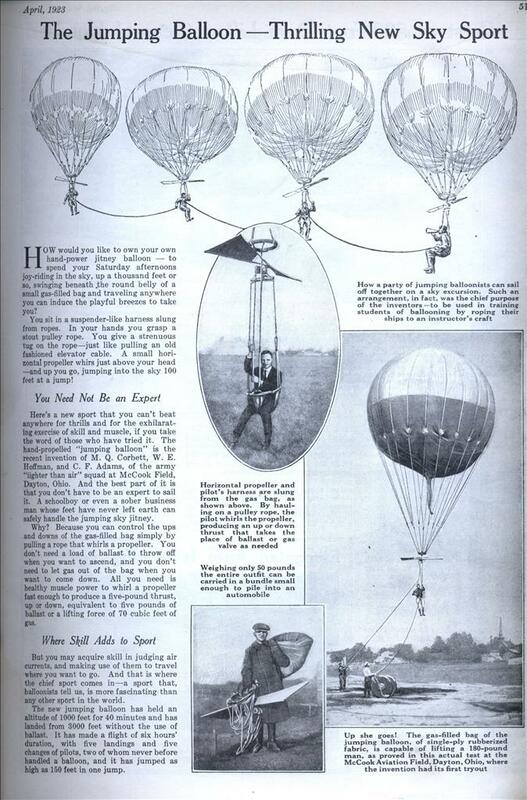 HOW would you like to own your own hand-power jitney balloon â€” to spend your Saturday afternoons joy-riding in the sky, up a thousand feet or so, swinging beneath the round belly of a small gas-filled bag and traveling anywhere you can induce the playful breezes to take you? You sit in a suspender-like harness slung from ropes. In your hands you grasp a stout pulley rope. You give a strenuous tug on the ropeâ€”just like pulling an old fashioned elevator cable. A small horizontal propeller whirs just above your head â€”and up you go, jumping into the sky 100 feet at a jump! You Need Not Be an Expert Here’s a new sport that you can’t beat anywhere for thrills and for the exhilarating exercise of skill and muscle, if you take the word of those who have tried it. The hand-propelled “jumping balloon” is the recent invention of M. Q. Corbett, W. E. Hoffman, and C. F. Adams, of the army “lighter than air” squad at McCook Field, Dayton, Ohio. And the best part of it is that you don’t have to be an expert to sail it. A schoolboy or even a sober business man whose feet have never left earth can safely handle the jumping sky jitney. Why? Because you can control the ups and downs of the gas-filled bag simply by pulling a rope that whirls a propeller. You don’t need a load of ballast to throw off when you want to ascend, and you don’t need to let gas out of the bag when you want to come down. All you need is healthy muscle power to whirl a propeller fast enough to produce a five-pound thrust, up or down, equivalent to five pounds of ballast or a lifting force of 70 cubic feet of gas. Where Skill Adds to Sport But you may acquire skill in judging air currents, and making use of them to travel where you want to go. And that is where the chief sport comes inâ€”a sport that, balloonists tell us, is more fascinating than any other sport in the world. The new jumping balloon has held an altitude of 1000 feet for 40 minutes and has landed from 3000 feet without the use of ballast. It has made a flight of six hours’ duration, with five landings and five changes of pilots, two of whom never before handled a balloon, and it has jumped as high as 150 feet in one jump. 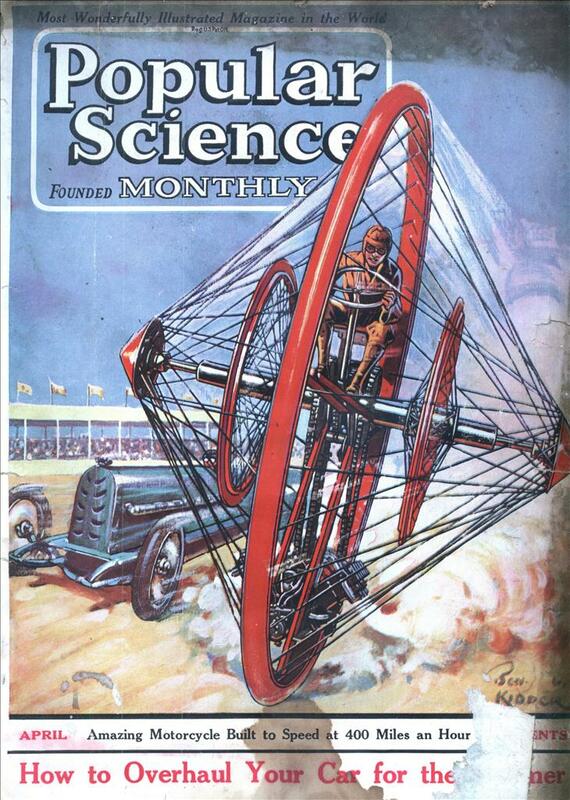 Hmmm, wonder why this idea never took off?